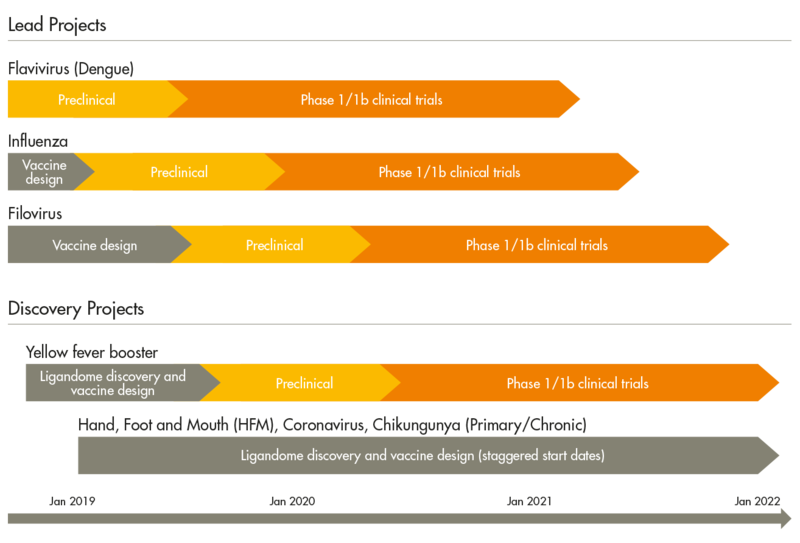 We have a pipeline of vaccine candidates in preclinical development. Our lead development programme is a universal Flavivirus vaccine candidate, EMX-001, which is cross reactive against Zika, Dengue and Yellow Fever. EMX-001 will start a Phase I clinical trial in H2 2019. We also have programmes in development for a universal Filovirus vaccine, to target Ebola and Marburg, as well as a vaccine that potentially can target the outbreak of a new pandemic strain of flu at the time it moves from an animal species into humans. We are also in the process of initiating earlier-stage programmes for a Yellow Fever booster and diseases caused by Hand, Foot and Mouth (HFM) virus, Coronavirus and Chikungunya virus.